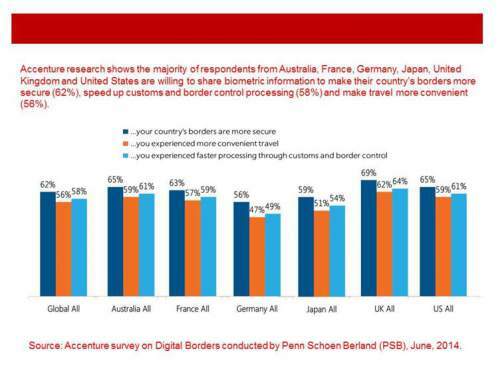 Accenture has just released the results from a new survey, which has found that a majority of U.S. citizens are willing to share biometric information to expedite travel, but that many people still have not shared any biometric information to date. Specifically, according to Accenture, the survey looked at responses from 3000 citizens across six countries, including the U.S., U.K., France, Germany, Japan and Australia. 87 percent of U.S. citizens said they were willing to share biometric information to facilitate convenient travel, and only 19 percent of respondents from the United States say they have shared any biometric information to date. In addition to travel, 65 percent of American respondents said they’d be willing to share biometrics to make borders more secure and 61 percent said they’d share this data to secure faster processing through customs and border control. Almost three-quarters (71 percent) of citizens support the use of biometrics to verify the identities of everyone that crosses borders and a similar amount – 73 percent – think that using biometrics this way would make countries more secure. “The very large majority of citizens willing to share biometrics when travelling was a surprise but serves to highlight the need for border management agencies to respond to this level of citizen support with appropriate technology, process and policy changes, that will meet the needs of travelers and better manage the secure transit of people across international borders,” Crego said. Though respondents are open to sharing this data, 68 percent of them said they’d want to know exactly what measures are in place to protect the information. Another 67 percent say they’d want to know how their biometric information is being used before they provide it. Also from the report, in Germany and Japan, less than half of respondents said they would submit biometrics to take part in an expedited travel program (44 and 49 percent, respectively). The Accenture survey also touches on the use of eGates, finding that only 15 percent of U.S. respondents had used an eGate. This contrasts with France, where 38 percent of respondents have said they’ve used eGates. In the United Kingdom, this figure is slightly less, at 24 percent. Of the respondents who said they have used an eGate, 84 percent said they had a positive experience and 91 percent said they found the eGates faster than manual checkpoints. eGates are a hot topic in the discourse surrounding travel biometrics, and Accenture’s findings are not isolated in this regard. According to separate research from Acuity Market Intelligence, airports are set to spend more than $2.2 billion globally on Automated Border Control eGates and kiosks between 2014 and 2018. Specifically, Acuity expects this particular market to grow at a 19.5% CAGR. New survey results show that the majority of U.S. citizens are willing to share biometrics for faster travel.